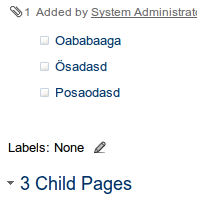 [CONFSERVER-25305] Umlaut characters are not sorted correctly in the alphabetical view - Create and track feature requests for Atlassian products. When browsing the view at http://confluence/pages/listpages-alphaview.action?key=SPACEKEY, the pages with umlauts in the title are always at the bottom. This behaviour contradicts with normal page tree inside the Page Tree macro, sidebar in Documentation Theme and also while browsing the space pages tree at http://confluence/pages/listpages-dirview.action?key=SPACEKEY.